Click Here for Info on “The Lively Art in Picture Books” at KU’s Sharadin Gallery, Oct 21-Nov 21. 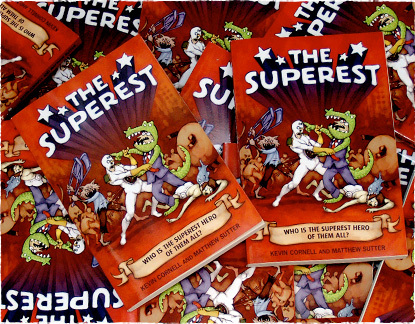 The Superest is a book based on a drawing game of dueling superheroes by KU grads Kevin Cornell and Matthew Sutter. The rules of Superest are : a) Player 1 draws a character with a super power. b) Player 2 then draws a character whose power cancels the power of the first character. c) Repeat. Now you can do it, too. Kevin Cornell and Sutter (he goes by his last name, like Usher) played the game so long that they got this slapstick book out of it, available at Amazon. Sutter began publishing a comic called Bean in the Keystone; then he collected Bean’s greatest hits into funky Xerox zines. One early Bean zine came with a pack of matches glued to the cover; try getting that on a plane. His output has been steady, and his production values have improved. Picnic Mountain was a handsome collection with a silk-screened cover on kraft paper. His latest anthology, published by LULU, is Return to Picnic Mountain. 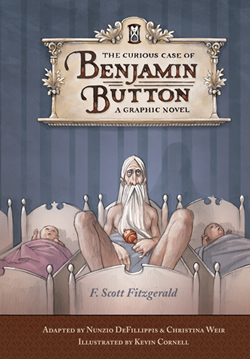 Martin Lemelman told me I’d be impressed by Kevin Cornell’s graphic novel version of The Curious Case of Benjamin Button. One reviewer called his illustrations “gorgeous” and I agree. Kevin did an outstanding job. He was good enough to share some of his preliminary sketches here on his award-winning website. I didn’t know the original story of Benjamin Button was written by the great American writer, F. Scott Fitzgerald. This book has that story adapted for the graphic novel format by writers Nunzio DeFillippis and Christina Weir. The afterward by Prof. Donald Sheehy, Ph.D, Edinboro U. of PA. adds fascinating insights into the creation of Fitzgerald’s original short story. I read a fair number of graphic novels and this is one of the finest examples of a literary adaptation I’ve ever seen.